The Fashionable Bureaucrat: The flowers that bloom in the spring, Tra La! Ok, I'm going to admit it. I'm sick. I'm pretty sure I have a rotten cold. You can see it on my face in this outfit photo. I stopped on my way home and bombed it with Pho and sriracha and now I'm drinking green tea. I hope it doesn't last long. Plus, who wants to call in sick on their 8th day at a new job? Yeah yeah, another pair of shoes. Sue me. I'm sick. They're medicine. I walked all the way to work in these and my feet are miraculously unharmed. ERMAGHERD look at the JF and the crown on the toes. *swoon* I fall down with love for them. I need to get red laces for them though. Ok, I'm going to bed. At 6:30. Ugh! The skirt, those shoes...perfection. I hope you feel better quickly! Red laces would be marvelous! My husband has those same shoes in robin's egg blue from a couple of years ago. Totally cute shoes!! I'm sorry you're not-sick though. Sounds like you're already following my usual "prescription" for a cold, though I'd probably also down some Nyquil and hit the hay early. Feel better soon, Megan. 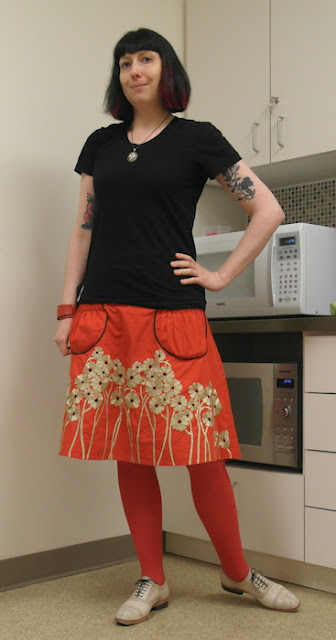 love that skirt, the color, the print and, of course, the pockets! !, and also love your shoes, they look really comfy and cool!, they would love über cute with red ribbons! Despite being sick, seems like this move is wonderful for you. Feel better. Take your medicine and get better - my flu is on it's 4th week now, it's no fun I'm telling you. I got knocked out with a flu last week. Get some serious rest! Feel better. Oh, and yeah... those shoes are swoon-worthy! I think it's a really common phenomenon, coming down with an illness when you start a new job. Exposure to new viruses, all those new people! And just because you really don't want to be ill, that always makes it more likely to happen! Love the shoes and the subtle JF on the crown (I didn't know that was called a crown). Red laces would make them perfect! Get well soon! 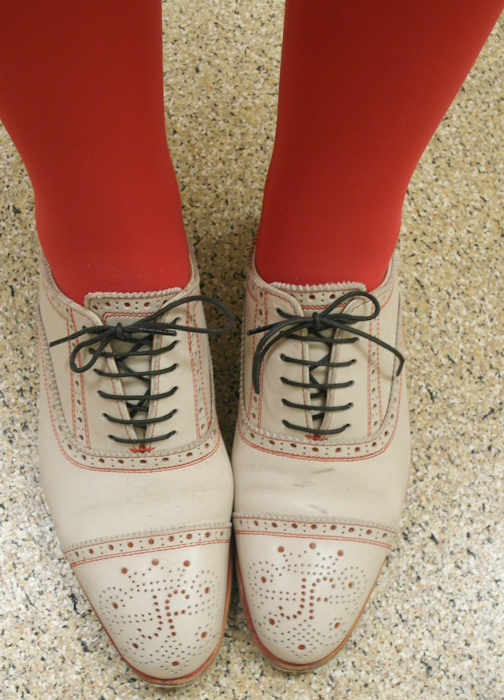 Those are swoon-worthy brogues, and with red laces....tooo much!! Feel better soon. Oh oh oh, lovely shoes! I hope they help heal you quickly. Oh wow, I love those shoes!! !